The rise of double hen parties. Could Meghan be planning a pre-wedding high tea? 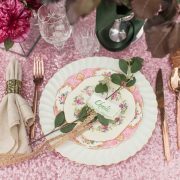 As the count down to the royal wedding is in full action, here at Vintage Flair we’re wondering if Meghan is planning her second hen – or should we say Bachelorette party! There has been a rise in brides-to-be hosting two hen parties in order to involve all the female wedding guests. 10 years ago hen parties were a night out with friends and family, for a meal and possibly onto a nightclub. Over the years they’ve become more elaborate and have evolved into weekends abroad and spa trips. As hen parties have become more expensive and often just for close friends and family, there has become a need for a second hen party. This is usually closer to the wedding date and suitable for all ages and a wider family audience. 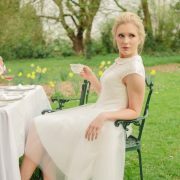 Afternoon tea is the perfect solution for this style of hen party. 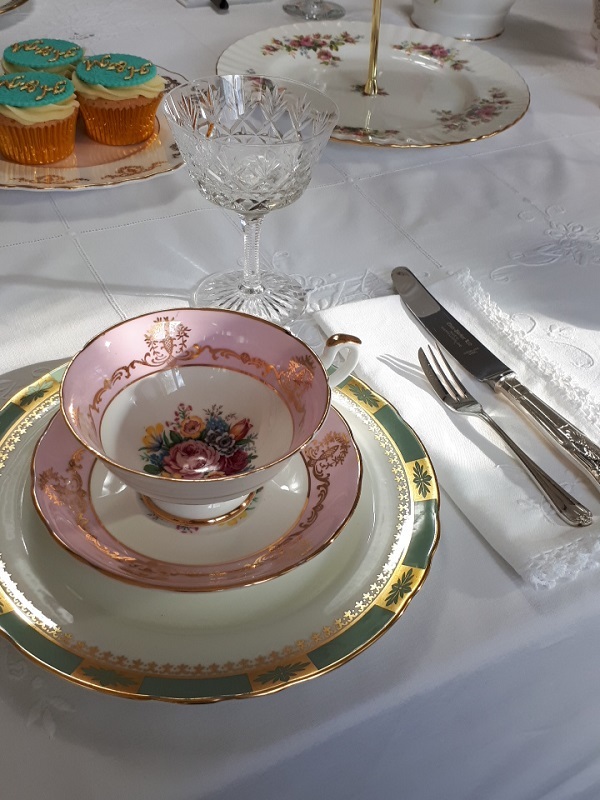 At Vintage Flair we receive lots of vintage china hire enquiries from those planning their second hen party and afternoon tea at a family member’s house is very popular. 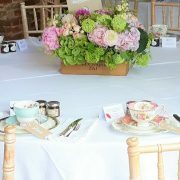 Champagne saucer hire has also been increasing as prosecco is added to the afternoon tea offering. If you’re following the developments of the royal wedding you will know that the style of cake has been revealed and we’ve seen the invites. It’s been rumoured that Meghan had her hen party back in March at a small, luxury spa with a few close friends. We are predicting Meghan might host her second hen party the week before her wedding. This would be prefect as it could include her US guests and would be a great way for guests from both sides of the pond to meet before the big day. As a guest, a wedding is always so much more enjoyable when you know others attending. 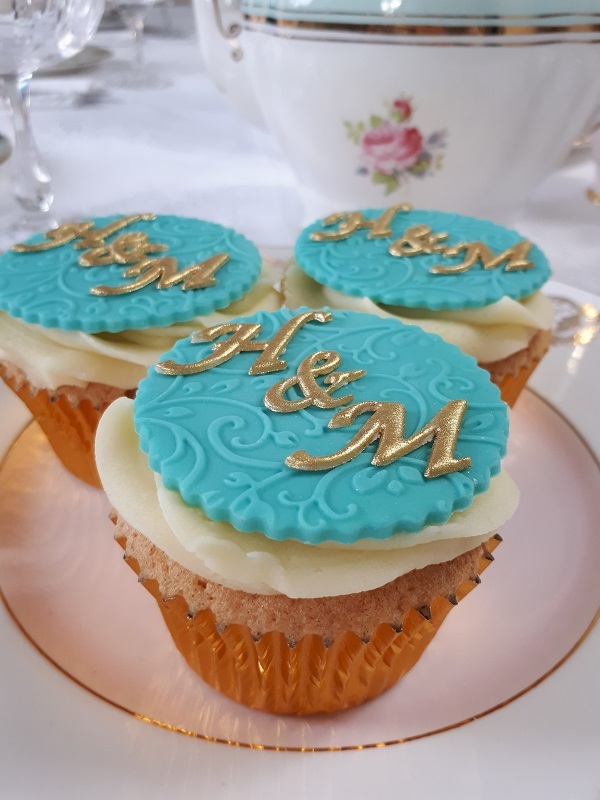 We’ve seen in the past how much Meghan enjoyed afternoon tea with the Queen and from Meghan and Harry’s choice of wedding cake we know she is a big fan of buttercream and modern style cakes. 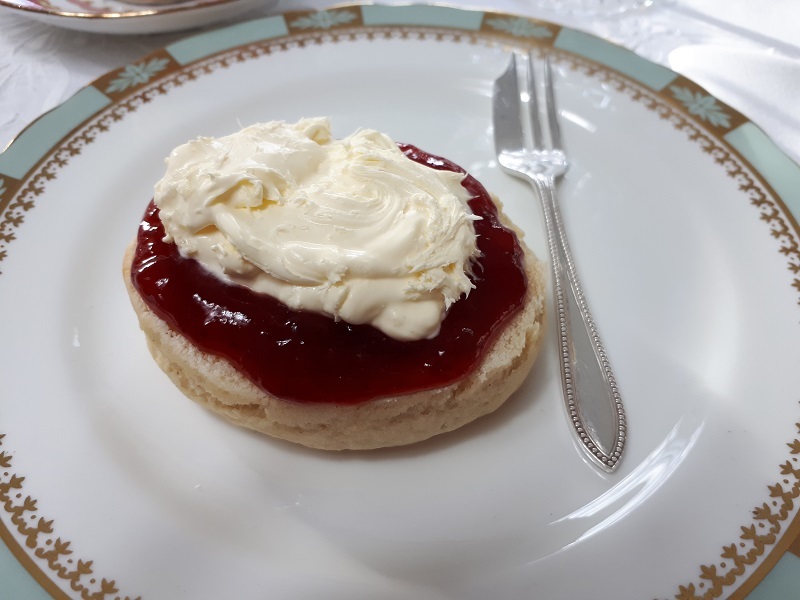 Afternoon tea would score some serious brownie points with the royal family and it’s the perfect way to celebrate with guests of all ages – who doesn’t like tea and cake! 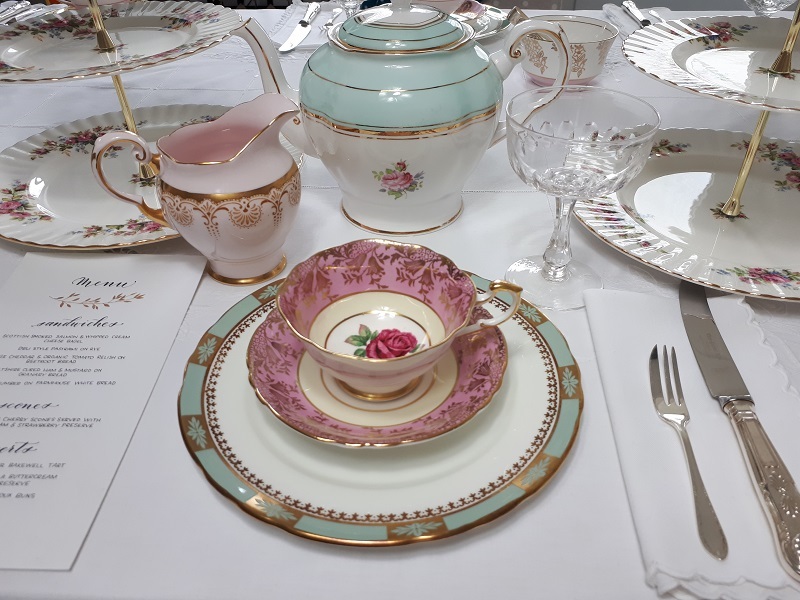 Vintage Flair predicts that Meghan would add a modern styled vintage twist to the occasion, by incorporating a selection of luxury English fine bone china, adding a little fun to the tablescape. 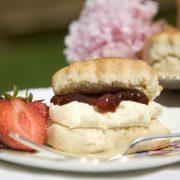 The perfect balance of American and English sandwiches followed by traditional scones and a selection of desserts. We know from her wedding cake that she loves elderflower and lemon and before closing her twitter account she’s mentioned how much she loves bananas! I think we’ve got the perfect balance and all her favourites included. The wedding invites were slightly more formal than we expected. Sharone from Sharone Stevens Design has kept the gold and black colouring but relaxed the predicted menu design with her talented watercolour calligraphy. 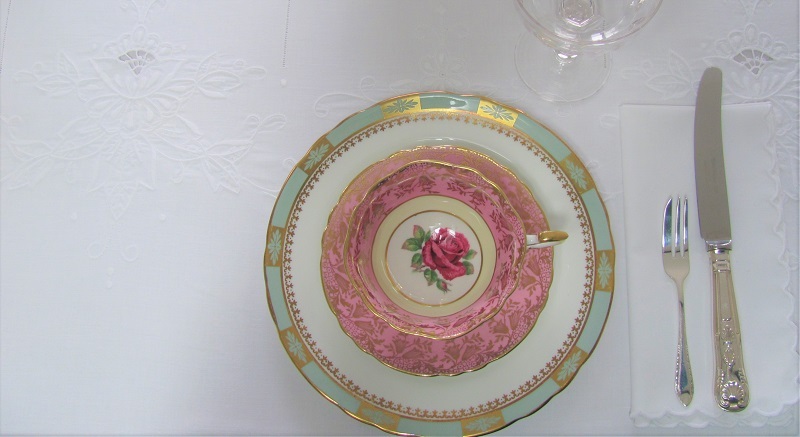 Gold is key to the high tea styling. 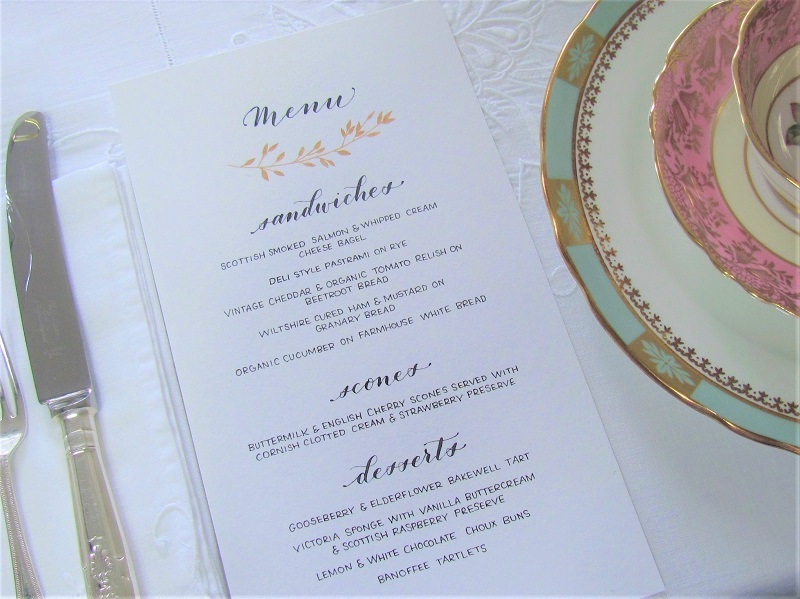 All of the fine bone china has gold gilt detail, the menu contains gold ink and every guest would be given a hummingbird cupcake with gold embossed initials. 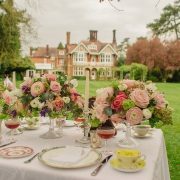 Now we know how much Harry & Meghan are big fans of giving business to small business owners, so we think Meghan would select a family run venue in the countryside, to allow privacy away from the madding crowd. We’ll await to see if our prediction come true and maybe we’ll find out the answer to the question so many will be wondering…. Does Megan add the jam or the cream first??? 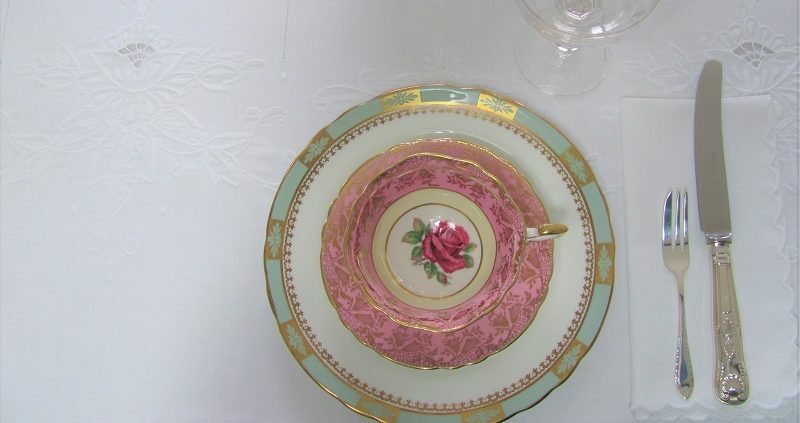 Vintage Teapots, 3-Tier Cake Stands (matching tiers), Vintage Teacups with matching Saucers, Vintage Plates 8″, Vintage Milk Jugs, Vintage Sugar Bowls, Silver Plate (EPNS stamp) Teaspoons, Pastry Forks, Sugar Tongs & Preserve Spoons, Vintage White Lace Napkins and Vintage Champagne Saucers. The key to this look is only using gold gilt fine bone china, silver cutlery (no stainless steel in sight) and only having two key colours. 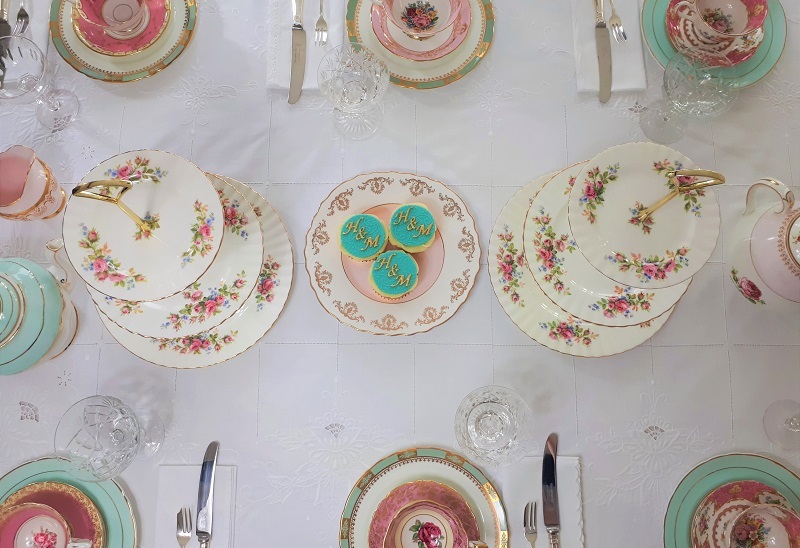 https://vintageflair.co.uk/wp-content/uploads/2018/04/Afternoon-tea-hire-London.jpg 437 800 vintageflairadmin https://vintageflair.co.uk/wp-content/uploads/2018/04/Vintage-Crockery-Hire-1.png vintageflairadmin2018-04-13 11:19:562018-06-11 10:23:39The rise of double hen parties. Could Meghan be planning a pre-wedding high tea?